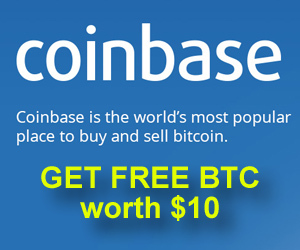 Home » Bitcoin-sites » Coinbase Review – Is Good Way To Buy Bitcoin Or Big Scam? Coinbase is the household name when it comes to the cryptocurrency business as it is among the most recognizable and frequently labeled as the most reputable exchange in the world. Coinbase is among the earliest players in the cryptocurrency exchange field, and it was created mainly with the function of serving as the most easily navigable exchange in the business tailored for use by those with little or no previous experience or knowledge of cryptocurrencies. Coinbase has a great user interface that has won it acclaim across the industry. It is also one of the very few exchanges with a stellar record when it comes to securing its customers’ assets. Coinbase is known to take very stringent measures in storing its cryptocurrency holdings as it is said to keep all its assets in completely offline vaults that are beyond the reach of hackers and other online criminals. This is one of the reasons why the exchange’s wallet is among the most popular hosted wallets only second to blockchain.info’s own wallet app. Read related post: Bitcoin Mining - What is ? How does work? If you are a first time trader trying to buy your Bitcoin for the purpose of storing or making your purchases with it, then Coinbase will certainly be among the exchanges you will find most suitable for your need as a newcomer. 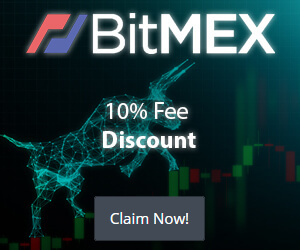 The exchange has a number of payment options with which its clients conduct their transactions. With the biggest point of attraction apart from security of course, being the ability of the user to buy their cryptocurrencies instantly with the use of credit or debit cards. Coinbase takes the time to verify the identity of its customers before allowing any considerable volume purchases using credit cards however, and such transactions come with a fee of about 3.75% which is not the lowest in the industry. If there is any drawback when it comes to Coinbase, it probably is that it is still limited in coverage to about 33 countries of the world, mostly US, Canada and EU countries. 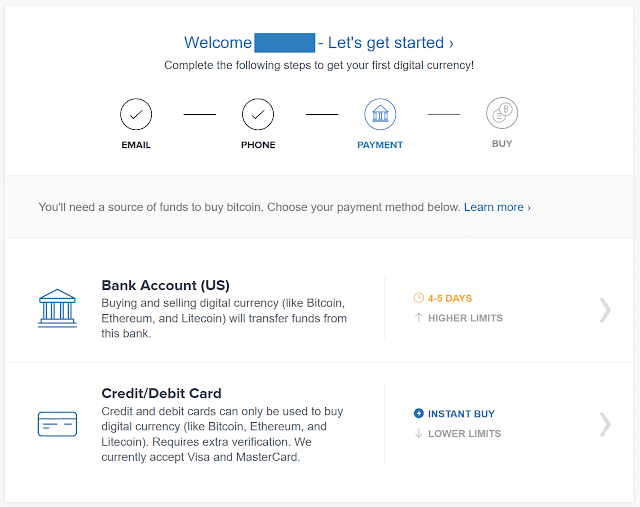 ● The first step you need to take is to navigate to the Coinbase official site and click on the sign up button on the homepage. ● A link will be sent to your mailbox with the link to authenticate that you are the one signing up with the particular mail address. ● One the authentication is done and your account is activated, you need to take a few more steps in order to begin trading, chief among them is the verification of your identity. You can do this by clicking on the “Add Payment Method” on your settings dashboard. ● You will see a place where you need to upload your government issued photo ID, such as an international passport or driver’s license. Kindly upload a clear copy of the document. ● Now add your preferred payment option, depending on your location you can add a bank account, or simply choose to pay using your Credit or Debit Card. Verification can take a few hours to conclude, and once you get an email notification that your account is duly verified, you can go ahead and use your chosen mode of payment to make your first deposit and then buy your preferred cryptocurrency. ⊠ Frozen Or Banned Accounts: One of the major grudges held by some sections of Coinbase customer base is that it often closes or freezes accounts without notice. While most customers affected by this might feel targeted or being hard done by, Coinbase is operating under regulatory rules and has to uphold strict Anti Money Laundry laws of the United States. Other accounts that easily get shut down by Coinbase include those related to the adult industry, or gambling sites. ⊠ Affiliate Reward inconsistency: One of the major grouse Coinbase users have against the platform is its perceived inconsistency with its referral reward program. Coinbase had a generous reward system where any user that refers a new customer who buys Bitcoin worth $100 and above, were rewarded with $75. This has since been stopped without warning by Coinbase, earning it the ire and dismay of its hardworking referral affiliates. ⊠ Close Relationship with the Banking Industry: Coinbase which is the number one cryptocurrency exchange in the world curiously maintains a more than cordial relationship with the banking establishment. Bitcoin and cryptocurrency enthusiasts all over the world are unrepentantly against any Banking industry influence, and Coinbase’s acceptance of investment from the likes of BBVA has raised brows with the crypto community. Read related post: What’s The Difference Between Altcoins And Tokens? ✔ Great user interface, ideal for beginners. ✔ Stellar track record for secure transactions. ✔ Flexible payment options like Credit Cards. ✘ Not a worldwide service at the moment.